Our school is set in the rural North Hampshire village of Overton. The carefully designed environment is laid out to encourage independence, freedom of movement and choice. Every child is treated as an individual with their own unique potential which, with the help of the parents, we help to fulfil. There is a happy, calm, friendly atmosphere within the Children’s House where the children learn life skills and prepare themselves for their future. They discover the joy of learning through hands-on experiences and exploration within a secure environment. 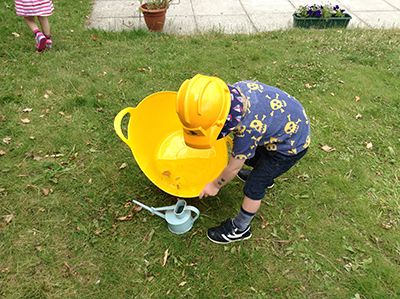 Watering the plants, washing up, splashing in puddles, buttoning, counting beads, making up words and painting a wall can all be part of a morning for a child. We make the most of our idyllic rural locations through daily access to a large garden ideal for parachute games, nature trials, sport, aeroplane impersonations and having fun. Visitors from the community; from musicians to policemen, and artists to dentists as well as regular outings to local farms all help the children find out about their world. The Children’s House (Hampshire) Ltd. provide child centred environments where independence is encouraged, individuality celebrated and children are given freedom within boundaries to follow their interests. Children are prepared for tomorrow’s world through learning life skills, developing creative thinking and a love of learning as well as being encouraged to love themselves and the world around them. We welcome visits from prospective parents and those with an interest in how a Montessori school works. Please contact us to arrange a show around. The reason why we send our children to school is to prepare them for their life ahead and equip them with the skills we feel they will need. Listening to today’s news, the challenges they will face will be immense; climate change, poverty, and war to name just three. At The Children’s House creative and independent thinking and learning, self- motivation, respect and interest in the people and our world and the ability to communicate with them, are all encouraged, together with a sound basis in literacy and numeracy. 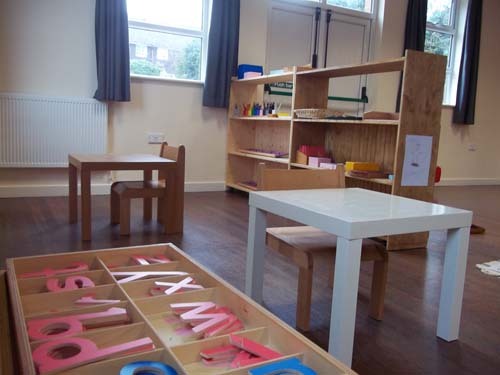 The Montessori curriculum is based around your child’s needs while meeting and often going beyond the requirements of the early years’ foundation stage and the national curriculum. Children are able to start with us from 2 years of age and stay until they are 6/7. These are the years when the child has the greatest capacity to learn; and what happens here lays down the foundations for all future learning. Children who stay with us in reception are in a small class with staff qualified and experienced in both primary and Montessori education. 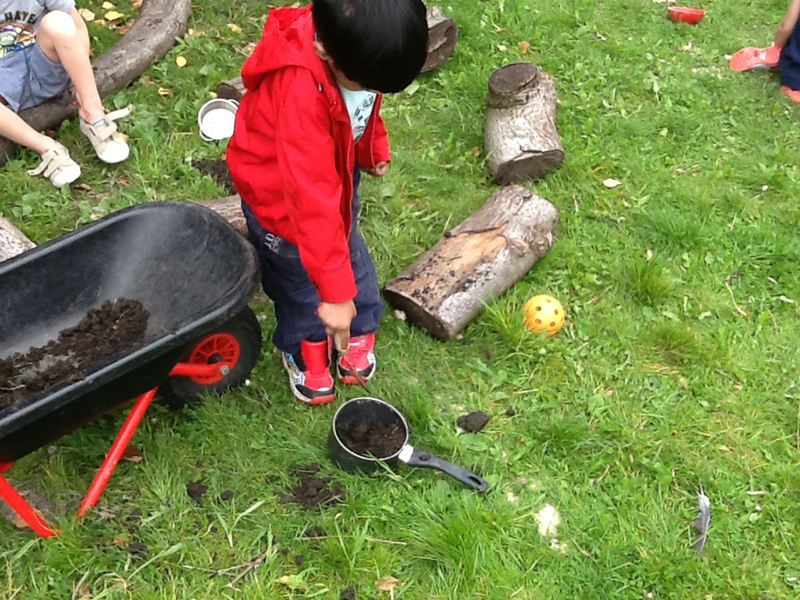 Continuity is ensured as the child builds on what they have already achieved and learned. There is no testing, instead continuous observations and evaluation of each child’s progress is made. Parents are able to have daily access to their child’s own website to view records and observations made. Each child has an individual work plan, supporting individual needs. Children have daily individual literacy and numeracy time with a qualified teacher. Children learn French through weekly French sessions. Other languages are also often used. Science, history, geography and culture are all enjoyed daily throughout the year. As every child is entitled to the education grant until the term after they turn 5 and as we also accept all types of childcare vouchers, staying with us is affordable especially when you consider the benefits for your child. These are just some reasons to consider joining us or letting your child stay on with us through the reception years. To find out more do visit us or simply call Sharon on 07748 642166. Sharon is passionate about Montessori education having originally trained soon after she left school. 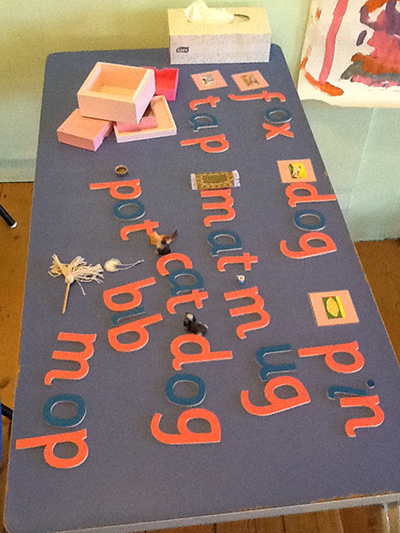 Vastly experienced, she has taught in both Montessori and traditional settings. Her understanding, enthusiasm and knowledge about children with special needs has led her to work as a special needs support in primary schools, as a child minder and as our setting’s SENCO. Sharon joined us in September 2007 and has been a senior member of staff for us for the last few years. Sharon became manager for The Children’s House in 2016 as well as our senior SENCO and works full time, splitting her time between both settings. Sharon is married with 2 children and enjoys spending time in Spain with her family. An experienced PA with a wide range of skills. Sarah started helping us with our administration and our invoicing in particular in September 2014. Usually working one day a week, she has become an invaluable member of our team, if we have a problem, she usually knows who can help if she is unable to do so. I gained my Montessori diploma in 1988 and I’m also a qualified cook. I enjoy teaching children for several reasons; their genuine curiosity and excitement in discovering ‘Life’ and I love being slightly instrumental in helping them grow mentally and physically. It has definitely enhanced my own life. I have 2 boys Jack and Finn and 2 dogs. In my spare time I like being outside and with my family. I am the safeguarding lead practitioner at the The Children’s House and new to Montessori. I love learning new methods, philosophies and methodology in teaching and enjoying completing my Montessori training at The Children’s House. I am a qualified Primary school teacher with experience teaching children between 4-11. I also have worked in a nursery and as a childminder with children aged between 10 months and 11 years. I have two primary school aged children of my own and have looked at teaching from many different angles. I am presently trying to achieve Montessori teacher status. I love working with children and watch them grow into mini adults! In my spare time I love working outside in my garden and in the greenhouse; when the weather is too bad I dabble in card making, beading and flower arranging. I have made bouquets and arrangements for a number of weddings. When the weather is good my family and I get in the car and tow the caravan away for weekends and some quality family time. Many of these involving, walking, cycling and me hiding away so I can read my book! During term time I also am a Rainbow Guide Leader in Overton. I love my job and love looking after your children, guiding them safely onwards in their life experiences. After working in publishing for many years in London, I then did my Montessori training in Winchester in 2007. I have worked in a Montessori setting since then. I feel it is such a privilege to be giving young children such a fantastic foundation in the Montessori environment before they continue their journey onto school. 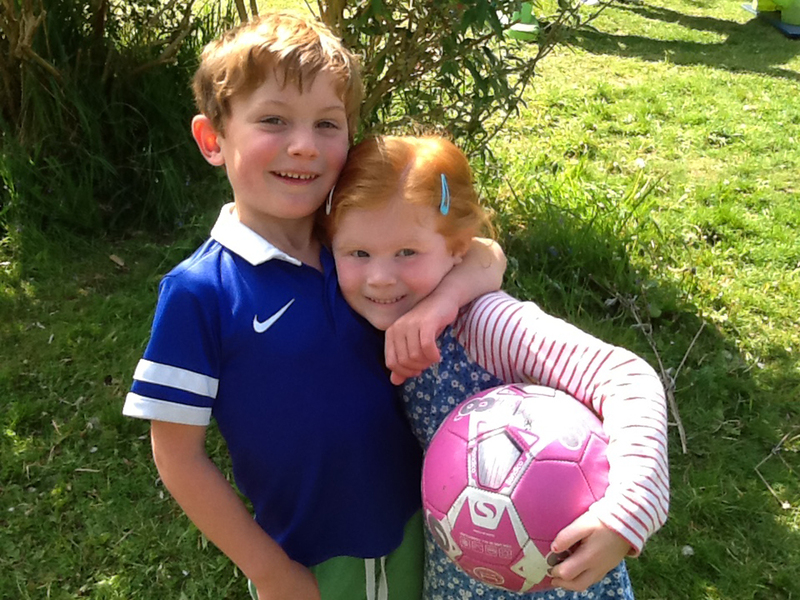 I have two children Olivia and Edward who have both experienced a Montessori setting, and I could not have asked for a better start for both of them. I enjoy spending my spare time with my family in France. I was first introduced to Montessori many years ago when I was an Au Pair in the USA. Seeing how wonderful this methodology of teaching is to young children and the head start it gives them in preparation not just for their school life but life in general made me want to do this for my own children one day. Twenty odd years on I have put all three of my boys through Montessori nurseries (my youngest attended both settings of The Children’s House even doing his reception year there), and can say with pride how confident and happy they are at primary school. I am a qualified personal trainer and worked part time in the Basingstoke Sports Centre for 8 years. I also have a degree in Psychology and worked in marketing and product management for many years before being made redundant. This gave me the opportunity to see my little ones more and finally do my Diploma in Montessori Pedagogy which I have just completed in July. I am now doing my professional placement at The Children’s House settings and loving every minute of it. In my very spare time I love gardening, going to our family home in France, walking my pug Frank and occasionally going to the odd car festival or formula one event. I originally trained as a physiotherapist and worked in this capacity until I had my first child. I have always enjoyed being around children, and over the last few years I have become more and more involved in childcare. Both of my daughters have attended Overton Children’s House, and had such a wonderful time that I jumped at the chance to work in this setting. I am hoping to further my experience and understanding of Montessori theory with training in the future. In the meantime, I am thoroughly enjoying my time at OCH and SCH, and gaining much experience there.